The very early morning of this weekend [10/03] can not get any more beautiful for any digital currency enthusiast when you see the coins re-taking the path of token value recovery and one of them is standing strongly above, the silver-coin Litecoin. 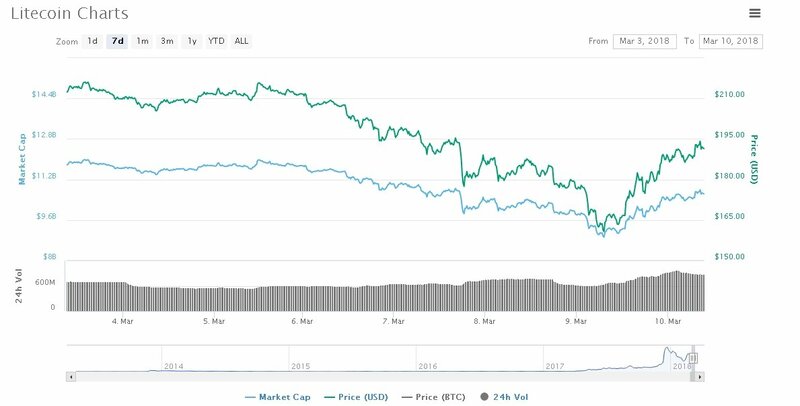 Mentioned in a tweet by its founder – Charlie Lee, as it is known that many direct the blame towards him when LTC/USD drops, Litecoin can be seen as the first coin to regain control and beat the bears. Per time of writing it is trading at $191.30 with 15.30 percent gain in the last 24-hours and rocking the $10 bil market cap cementing its 5th place in the crypto-leader board. For the time being, a major hurdle would the $193-$195 area showcase as that is when the violent sell-off initiated on March 8 2018. So, for now be on the lookout if the pair LTC/USD can close successfully above the $195.00 level as it would open doors to re-test the important psychological $200.00. Very strong standing out are almost all coins as a double-digit gain can be seen in most of them – Monero 14%, NEO 10%, Nano 27.30%. Nano in a recent tweet has been promoted very strongly by the founder of Litecoin [LTC] as he described it very successful. I took a look at Nano currency recently. Pretty neat. Every account has it’s own blockchain. It focuses on fast and free transactions for payments. Uses PoS for double spend protection and PoW to fight spam. The challenge is to keep it decentralized.